Hot and humid summer weather affects turbine performance substantially, yet this is the most critical time for power plant service to users. A knee-jerk reaction would be to enhance installed turbine capacity to offset the deficit created by subdued performance and increased power demand. Instead of this costly route, experts discovered that since gas turbines rely on a constant-volume cycle, cooling inlet air could increase turbine performance markedly. Various inlet air-cooling methods used to achieve this state over the years include mechanical chillers, absorption chillers, fogging and evaporative cooling. Have you ever wondered how the fogging system for cooling turbine inlet air works? It is an important technology considering that it improves turbine performance, but there is a better option. Below are the basics of fogging system and a comparison with TIAC with chillers, an innovative power augmentation solution that ARANER offers worldwide. Fogging has been around for almost three decades. It is an evaporative cooling technology. Others in the same category are wetted media and wet compression. Atomizing nozzles are probably the most critical components of the system. They sit within the inlet air duct in a special formation. Other components are programmable logic controller (PLC) and high pressure pumps. All these combine to generate fog as shown in Figure 1. The basic idea behind this system is to feed the inlet air with fine water droplets. Depending on ambient conditions and expected evaporation time, these droplets can be of any size, but usually between 20 microns and 40 microns. Fog forms once high pressure demineralised water passes through the atomizing nozzles. Once the water is ejected from the nozzles, it strikes impaction pins, creating billions of water droplets. There are at least two popular locations of nozzles in relation to air filters. Often, they are placed downstream the air filters, just before the trash screen and silencers. This arrangement is preferable because its effects on the existing turbine design are minimal. Furthermore, it offers the droplets more time to evaporate. However, installing this system may mean an outage of a couple of weeks. Alternatively, the nozzles can be placed upstream the air filters, in which case more water and more fog nozzles are required. Because of these extra requirements, this system is more expensive and therefore undesirable for many proprietors. Two advantages with this system though: there is no outage time. The success of a fogging system for inlet air-cooling depends on how well the fogging nozzles are designed. For example, the impaction pin has to be of the highest quality and parameters. The nozzle is also designed from 316-stainless steel to offer reliable performance over a long time. Pump design is equally important. The positive displacement pumps come with heads made from stainless steel. Away from these design considerations, performance of a fogging system relies heavily on weather. Humid weather makes the system inefficient. However cheap such a system is, would you want to use it where predictable performance is critical? A TIAC system with chillers involves air that passes through a cooling coil containing either refrigerant or chilled water. In case of chilled water, the source could be either a thermal energy storage tank or chiller. 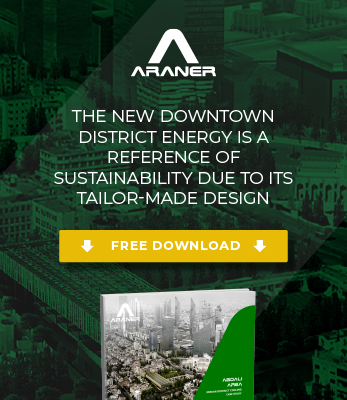 ARANER uses the TESTIAC system, which is a combination of thermal energy storage (TES) tanks and TIAC with chillers. If you were presented with fogging system and TIAC with chillers, which option would you take? Many factors come into play including efficiency and cost. If you are considering cost alone, the obvious choice is a fogging system. Chillers are more expensive to install than fogging equipment. However, remember that initial costs are only part of the equation. You need to consider what happens to the power plant during humid and hot days of summer. Power demand shoots at such times because everyone has switched his or her air conditioners. A power plant that relies on fogging (a system that is affected by ambient conditions) does not offer a guarantee on the power output. While one may have used less in installation costs, the production of inadequate megawatts when need is highest is almost unbearable. TIAC with chillers is non-reliant on ambient conditions such as humidity and temperature. When humidity rise, it becomes difficult to maintain high levels of efficiency in a fogging system. In both hot and cold climates, humidity can pose challenges to a fogging system. For the sake of fluidity of operation, ARANER experts prefer TIAC with chillers. Are you interested in learning more about the benefits of TIAC as compared to fogging system?